The represents the version 2 (1997 release) of the Global Topographic Data Record (GTDR-SINUS.3;2). The range to surface is derived by fitting altimeter echoes from the fan-beam altimetry antenna as a function of time to Hagfors' radar backscatter model templates. The ranges are subtracted from the spacecraft radial coordinate (derived from Doppler tracking), yielding measurements of planetary radius. 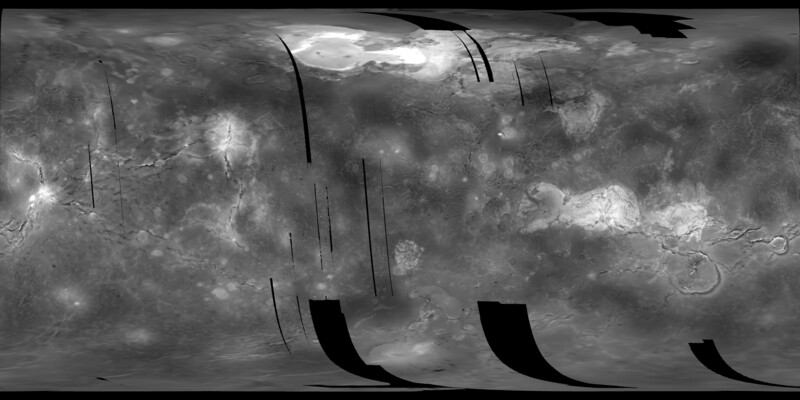 The data are filtered to remove low-frequency errors in the in-plane elements of each spacecraft orbit, and then originally re-sampled into sinusoidal, Mercator, and north and south polar stereographic projections at a resolution of about 5 kilometers per pixel. Each GTDR pixel is represented by a 16-bit integer. Pixels lying outside the domain of the projection are set to NoData (-32678). In all images, pixels with unknown or unmeasured values are also set to NoData . The remaining values have been processed into elevations with a data range of -2951 to 11687 meters. Ref: Software Interface Specification Document (Peter G. Ford, 1991, Global Altimetry and Radiometry Data Records, MIT-MGN-GxDR SIS Version 2.3, 40 p.) that is included on GxDR CD-ROMs. Note: There exist photoproducts that are identified as GxDRP (where x is E (Emissivity), S (Slope), RE (Reflectivity), or T (Topography)) however, they are not generated from the digital GxDR products. They are instead produced from the Magellan ARCDR (Altimetry and Radiometry Composite Data Record) data files. Topographic elevation in meters as collected from Magellan altimetry. The original PDS release was map projected to Simple Cylindrical and the offset and scaler were applied to return elevation values with the range from -2951 to 11687 meters. This archive was produced by Jason Hyon. Mike Martin (JPL), Gail Woodward (JPL), Peter Ford (MIT), Robert Mehlman (UCLA), and Jason Hyon (JPL) designed the PDS labels and the tables. Florence Moss (JPL) and Jason Hyon developed the software to generate the PDS labels and tables. Raymond Arvidson and Gail Woodward created the catalog templates, with help from Pam Woncik (JPL), Mary Dale-Bannister (Washington University), and Susan Slavney (Washington University). The data and documentation were generated at MIT by Peter Ford, Gordon Pettengill, Fang Liu, and Joan Quigley from data supplied by the Magellan Project. Please direct any questions and comments to the PDS Geosciences Node, geosci@wunder.wustl.edu.